Bagels were a staple in our house when I was growing up, and every Saturday morning my father would drive down to Three Brothers Bakery and come home with a couple dozen assorted bagels, which would last us through the week until the next Saturday, when he would go get more. But every once in a while he would surprise us, and come home with a box of assorted Danish instead (or on those rare, special occasions, both). This was mostly when we had company for brunch. Cherry, apple, lemon, pineapple and cheese - I loved them all and it was always a little bit of torture having to decide which one I was going to have, because it meant that I would not be having any of the others. The dough was more chewy than flaky, and it was soft and buttery. The fillings were fruity and not too sweet, and there was just a hint of glaze threaded over the top to add a touch of sweetness to the dough. Left alone, I could have eaten the whole box myself but, alas, two was the most I ever managed to wrangle. When we moved to Dallas it took a while, but my father finally found a place that had decent bagels. But that was all they had, and I don't believe I ever had a Three Brothers danish ever again. And no danish I have had since has been able to come close to my memory of the taste of those lovely treats. I realized that it was probably my memory of how they tasted that made later pastries suffer in comparison. Whatever the reason, I just haven't been all that interested in sweet rolls. 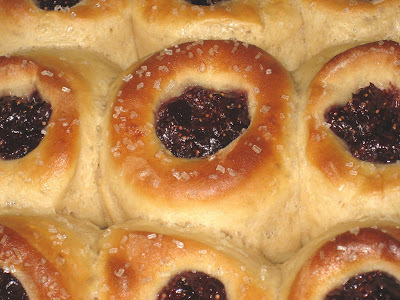 It turns out that the base for the hamantashen was a basic sweet bread recipe that could not only be made into hamantashen, but was also good for sweet rolls and other sweet breads. I don't know what prompted my decision, but I was happy enough with my success with the hamantashen that I decided to take a stab at the sweet rolls. The recipe looks daunting, but it is actually fairly easy and does not take that long. It was easy enough, and the sweet rolls went over well enough (including a request for the recipe) that I have already made them again, and plan to put them into a semi-regular rotation. And now that I am making my own jams, I don't have to worry about whether or not I have any in the pantry. These days I almost always have a jar of some kind of home-made jam in the freezer. These sweet rolls are actually not like those ever-elusive Three Brothers sweet rolls at all. But they are very, very good. I believe it is worth mentioning that the directions for the recipe in the cookbook is one paragraph long. It tells you what to do, and assumes that you know how to do it. If I hadn't been making breads and baking as much as I have been these past few years, I don't know that I would have known what to do, so I have expanded the recipe to include more detailed instructions. "Dissolve the yeast in warm water. To the scalded milk add the butter, sugar, salt, a little nutmeg and lemon. When lukewarm, add 1 beaten egg or the beaten yolks of 2 eggs; stir in the yeast and only enough flour to knead. Knead dough until smooth and elastic. Cover tightly and let rise until doubled in bulk. Cut dough down, form into desired shape and bake in a moderately hot oven (375 deg. F.) until browned." It seems easy to me now, but there was a time when I would not have known what to do. I hope my version will be easier for the less experienced cook to feel comfortable enough to jump on in and get started. *I have also successfully made this dough using 100% whole wheat white flour. Put the warm water in a small bowl. Add the yeast and let it dissolve. Once the milk is scalded (do not let it boil), remove from the heat and add the butter, sugar, salt, nutmeg and lemon zest. When the mixture is lukewarm, pour it into a large mixing bowl. Add the egg and the yeast and mix well. Combine 2 cups of all-purpose flour and 2 cups of white whole wheat flour and whisk together. Add to the yeast mixture and stir vigorously. Add more flour as necessary until a soft dough has formed. Turn the dough onto a floured surface and knead until it is smooth and elastic, adding only as much flour as necessary to keep the dough from sticking. Put the dough back into the bowl and cover with plastic wrap. Leave in a warm place to rise until it has doubled, about 1 to 1-1/2 hours. While the dough is rising, make the filling: Combine the blueberries, sugar, lemon zest and water in a medium saucepan over medium-high heat. Bring to a boil, lower the heat, and let simmer until the blueberries have broken down and the sauce has thickened. Set aside to cool. When the dough has risen, punch it down and turn it out of the bowl. Preheat the oven to 375 deg. F.
Divide the dough into two equal pieces and set one aside, covering it with plastic wrap. Roll the first piece into a 1-inch thick rectangle. Cut into 2-1/2-inch circles and place close together on a baking sheet that has either been greased or covered with parchment paper (I use parchment paper). Repeat with the second piece of dough, re-rolling the leftover scraps and cutting more circles until you have used up the dough. Let rise for about half an hour, until they have almost doubled. With your fingertips, make a cavity in the center of each roll (dip your fingers in flour if necessary). Drop about 1/2 teaspoon of the blueberry filling into each hole. Brush the dough with the egg white mixed with water, being careful not to smear the filling. Sprinkle the coarse sugar over both the dough and the filling. Bake 20-25 minutes, until the rolls are golden. Start checking after 10 minutes. Let them cool enough for the filling to set.